In honor of the new Will Ferrell movie, Land of the Lost, the Sci-Fi Channel recently played a marathon of the original 1970's television series. I knew I was going to see the film so I thought I'd check out the source material to see what I was in for. I watched about ten minutes of it before I had to change the channel. It was that bad. However, after seeing the movie, I've reached a denouement. I say this in complete honesty. I would watch the complete series of the original show before watching this travesty ever again. Will Ferrell plays Dr. Rick Marshall, a paleontologist who uses his Tachyon Meter, which doesn't take you forward or backward through time, but sideways, to propel himself through a space vortex, landing him in the Land of the Lost. Sucked through the vortex with him are Will (Danny McBride) and the lovely Holly (Anna Friel). There they meet Cha-Ka (Jorma Taccone), who journeys along with them as they meet a host of colorful creatures and attempt to find the misplaced Tachyon Meter that will take them home. Land of the Lost is hands down one of the most idiotic movies I've had to sit through in quite some time. It's part romance, part sci-fi, part adventure, part comedy, and all stupid. I haven't been so fidgety in a movie in years and I couldn't wait to get out of the theater. Like a kid frantically searching for his inhaler, Land of the Lost runs about wildy, grasping at air in the hopes that something will save it from its moronic story, shoddy special effects and painfully unfunny humor. It isn't just bad, it's an utter disaster. Like its competition, The Hangover (read my review here), Land of the Lost pushes story to the wayside in favor of quick jokes and even quicker transitions. The difference, however, is that The Hangover is actually, you know, funny. Land of the Lost is not, mostly due to its dull gags, including a recurring joke where Cha-Ka grabs the private parts of anyone nearby. The movie is only about an hour and a half, but it feels triple that length due to its vapid drollery, which results in an endless cycle of patience testing shtick, of which only 13 year old boys and die hard Ferrell fans will be able to withstand. I recognize that this is a movie to be taken lightly, but is it really too much to ask for at least an attempt at making a quality product? Land of the Lost is lazily put together with middling special effects and problems so apparent, you'll be shocked that the filmmakers let them slip through into the final product. In one scene, Dr. Marshall is being chased by a T-Rex, so he hops in a limo and crawls forward while the dinosaur crashes down on top. Seconds later, in the very next shot, he's hundreds of yards away, somehow escaping his inevitable death trap. Additionally, Ferrell was unconvincing as a world renowned paleontologist who has figured out a way to travel to alternate dimensions because, quite simply, scientists do not act the way he does in this movie. He is a one note actor, never switching his style up from movie to movie and it's become tiresome. He's had some genuine hits, as well as some stinkers, but this is hands down the biggest pile of crap he's ever had his name attached to. He's not interesting, he's not that great of an actor and he's not even that funny. It's time to move on. There were times during the flick when I thought, "You know, this isn't entirely bottom of the barrel," but then a monumentally asinine sequence would immediately follow and that thought would quickly get displaced. Rarely do I give out such a low score unless I truly feel it's deserving and there's none more deserving than this. 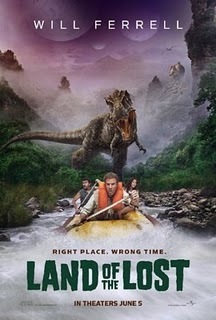 Land of the Lost is a stain on cinema and is destined to go down as one of the very worst films of 2009.